20 years ago, Metal Flow and the Brown family established the Metal Flow Corporation Fund, a named unrestricted fund that’s part of our Community’s Endowment, and they’ve been supporting it ever since. Metal Flow Chairman Leslie Brown’s late husband Marc and his late father Curt founded Metal Flow in Holland in 1978. Giving back to the community has been part of the company’s success story since its beginnings in a garage-sized building on 19th and Columbia. “Between the two of them, they had the youth, strength, and smarts for success. Entrepreneurial spirit was in their blood. We knew that giving back was to be embedded in our company culture from the very start. We knew it would be part of who we are,” said Leslie. Leslie Brown: Chairman of Metal Flow — Photo credit: deVries photography in Zeeland, MI. 38 years later, Metal Flow is an innovative worldwide leader in deep draw and progressive die stamping. 1980 was the year that sparked the company’s growth. “We went from this tiny, tiny company to producing every spoke hex nut in the country for many years,” Leslie recalls. 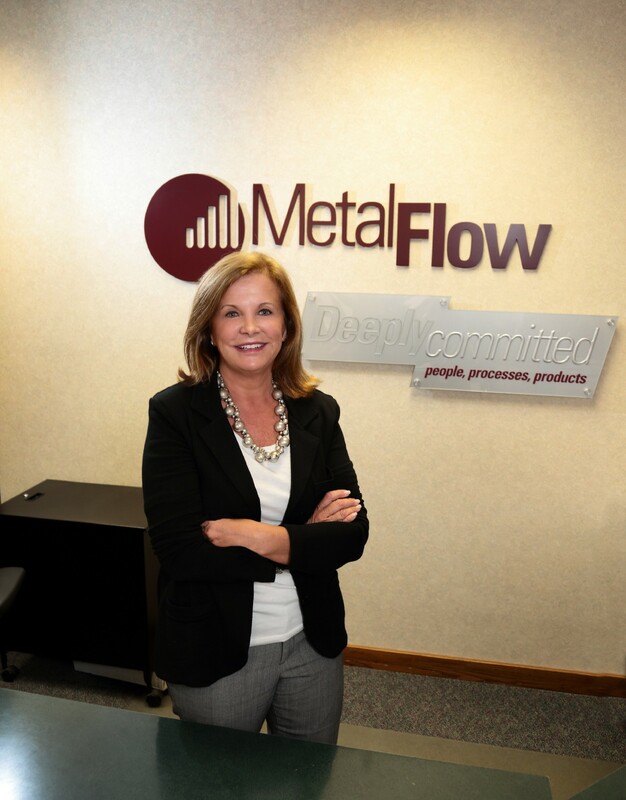 Metal Flow has experienced steady growth since then and now has over 230 employees. They stamp 1.3 million complex components of varying shapes and sizes every day, shipping products all over the world. It is estimated that 70% of all cars on the road in the United States have at least one Metal Flow part. Metal Flow received the 2015 Business Leadership Award from the Michigan West Coast Chamber of Commerce, which recognizes outstanding chamber members who give back to the community, invest in their facilities and employees, and that have a positive history of job growth and retention. Just as the company has grown over time, so has their giving. “Foundational to everything we do is giving back to the community that supports us,” said Leslie. They’ve supported local efforts such as Project Clarity, Tulip Time, and the 4th of July fireworks, as the lake and the festivals are things employees and their entire families can enjoy. They also support programs that benefit families and children in need. “With a family business, we make decisions both as a family and as a leadership team. Our decisions and dollars are always locally focused,” said Leslie. Brown has inspired many with her own personal contributions locally. She received the 2013 Lakeshore ATHENA award for her exceptional leadership skills, community service, and assistance in helping other women reach their own leadership potential. Each year Metal Flow holds an annual fundraising drive where all employee raised dollars are matched by the company, and the employees help choose where the dollars go. “We want our employees to be proud when we’re giving back in the company name,” Leslie noted. “We recognized really early on that the Community Foundation was the place locally that could make giving decisions for us long after we’re gone. A gift to the Community’s Endowment supports so many needs that we might not be aware of personally or as a company,” said Leslie. Leslie remembers her and Marc talking about giving in general and giving through the Community Foundation over the dinner table when her children were young. “It’s an important conversation to have as a family. We strive to make wise decisions as a company and through our giving, and we discussed together how giving to the Foundation would help support Holland/Zeeland forever and always, and how the Foundation uses community expertise to make their decisions,” recalled Leslie. Son Brian, who opened True Die in October of 2015, and daughter Chelsea, Human Resource Manager at Metal Flow, understand their family’s legacy of giving. It is a legacy that has always been important to the children and grandchildren of Curt and Marc Brown, and one that will be carried on for generations. “Being a good corporate citizen is so important. Once instilled, it becomes a great habit. It’s about what’s important, what needs are out there that we can help fill, said Leslie. To learn more about establishing an unrestricted fund for your family or business, contact us at info@cfhz.org. Featured in the Community Foundation’s Spring 2016 Newsletter. While this was written by CFHZ’s Communications Manager Nicole Paquette in 2016, we believe that stories of generosity are timeless and always relevant. Ensuring that Holland/Zeeland MI thrives today, tomorrow and forever by building our Community’s Endowment and helping donors achieve their charitable goals.